S is for Spring… and Shakespeare! Spring in Jacksonville brings a host of fun outdoors events. It seems like everyone wants to enjoy the fresh air, and it’s easy to find new and interesting weekend activities because there are all kinds of festivals and other events around town. Last weekend I took advantage of one of these events and went to the annual Shakespeare in the Park production in Atlantic Beach (about 15 minutes from campus) with Sara Boyle, one of our recruiters. The event is presented by UNF’s Department of English and is performed by UNF students and directed by our English faculty. 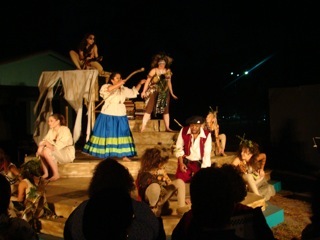 This year’s selection was The Tempest, a play about magic and manipulation on a deserted island. I had never seen the play before, but the staging and acting was great, the sky was clear and the weather was perfect. All in all it made for a great Friday night!